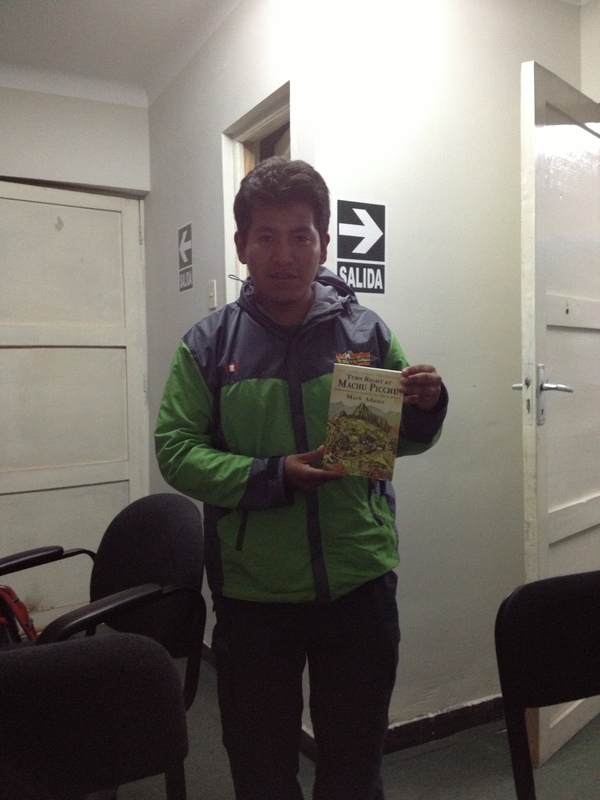 Amazing Alpaca guide Efrain receiving a copy of Turn Right at Machu Picchu as a gift from a happy client. National Georgraphic came out with another great list of suggested books to read before visiting or while visiting Machu Picchu. Of course Turn Right at Machu Picchu has been on best sellers list and is really popular with many travelling. Some have even thanked their Alpaca guide with a copy of the book (Thank you Kathy). National Geographic created the below list of books, separated into categories for easy reference. If you have any books you see missing, please let us know. We are beginning our own list. Bingham wrote his classic synthesis of adventure, discovery, and history in 1948, 37 years after his discovery of Machu Picchu and just a few years before his death. Bingham reconfirmed what he thought he’d found at Machu Picchu—the fabled last stronghold of the Inca. With Machu Picchu, he’d absolutely found a lost city, just not the lost city. Another of his discoveries at Espiritu Pampa was confirmed as the lost city in the 1970s. Though his conclusions about what he’d found are inaccurate, one can’t help but be drawn into his very real-life jungle adventure. MacQuarrie writes a detailed and narrative history of the Spanish conquest of the Inca. Dramatic and historic, this reads more like fiction than the modern standard-bearer of the epic tale of exploration and invasion, John Hemmings’s Conquest of the Incas. It’s interesting to compare MacQuarrie’s more serious history with Bingham’s Lost City to see where Bingham made his leaps of faith, as well as understand how well researched his expeditions were. MacQuarrie also spends a few chapters on the history of Inca research and discovery since the conquest, including Bingham’s adventures as well as explorer Gene Savoy’s work at Espiritu Pampa. Both of these guidebooks are the most detailed and accurate offerings in this category. Machu Picchu Guidebook is a rich guide written by two Machu Picchu experts. It features photos or drawings for each building and object at the site. The guide comes with a full-color architectural rendering of the site as well as a poster that once accompanied an issue of National Geographic magazine. There are many miles of Inca trails across the former empire, and The Inca Trail focuses on those in and around Cusco and Vilcabamba, including the famous Inca Trail that leads to Machu Picchu. The book is filled with detailed trail maps, as well as archaeological site maps of the ruins strewn throughout the region. An updated fourth edition is in development. A strong companion piece to these two guides is Johan Reinhard’s Machu Picchu: Exploring an Ancient Sacred Center, which helps synthesize what Machu Picchu and the surrounding sites may mean. While a little hard to classify, Adams’s Turn Right at Machu Picchu is a serious (and seriously funny) travelogue, a smart and tightly written history, and an investigative report into perhaps the greatest archaeological discovery in the last century. Adams sets off on a rediscovery of Machu Picchu, the way Bingham did 100 years ago this July, by hiking, climbing, slogging, tenting, and exploring his way through the jungles of Peru. His adventure culminates with a visit to the site that was recently named one of the world’s new seven wonders. Cradle of Gold recounts the discovery of Machu Picchu, but also dives deeply into the expeditions leading up to this seminal archaeological discovery, as well as later expeditions and the political intrigues that still exist today. Heaney provides a thrilling account of Bingham’s journeys, through the multifaceted lenses of reports related to his Peruvian expeditions, as well as his own well-known accounts. This picture book traces Hiram Bingham’s trek from Cusco to his discovery of Machu Picchu. A few of the key characters involved in this portion of Bingham’s 1911 trip are interspersed into the short book, but the boy who ultimately led Bingham to the ruins adds a dreamlike quality to the tale. Lewin’s watercolors fill entire pages and explode with color. This book makes the adventure into the Inca heartland accessible and exciting for a would-be traveler and his family. For the original article posted by National Geographic, click here.